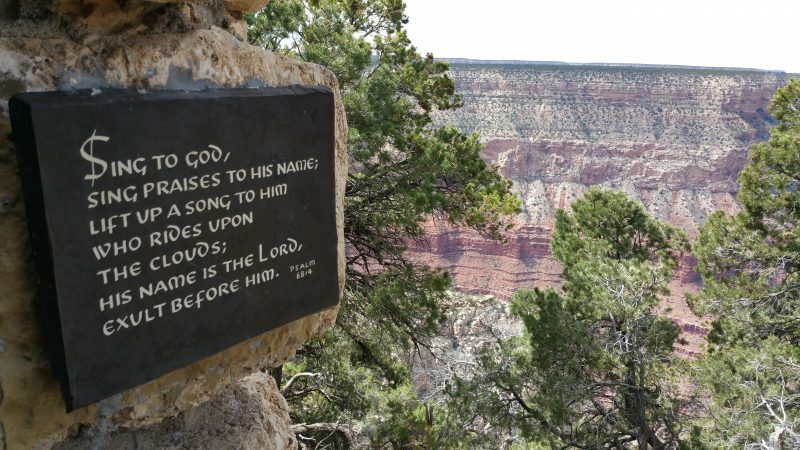 A sign is seen in late March outside Hermit’s Rest extolling the Creator of the beauty below in Grand Canyon National Park in Arizona. (CNS photo/Ana Rodriguez-Soto, Florida Catholic) . 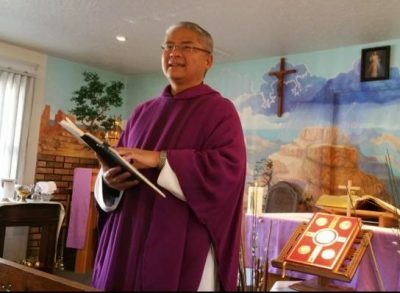 GRAND CANYON NATIONAL PARK, Ariz. (CNS) — Father Rafael Bercasio pastors perhaps the smallest parish in America — and the most uniquely situated. A short walk away from the south rim of the Grand Canyon sits El Cristo Rey Chapel, a small wooden building that serves as the spiritual home of the Catholic families who work at the national park. El Cristo Rey, a parish of the Phoenix Diocese, has 26 registered families, who are “always outnumbered by the tourists,” Father Bercasio said. The chapel is located within the boundaries of Grand Canyon Village, a residential neighborhood of around 1,500 households that includes a school, a grocery store and a post office. Residents are employed as park rangers and naturalists, maintenance workers, and hotel, restaurant and retail staff. Some live there only six months out of the year, although the park is open year-round. “You cannot live here if you’re not working in the Grand Canyon,” the priest explained. Grand Canyon Village is perhaps more familiar to park visitors as the site of historic hotels such as El Tovar and the stopping point for the most photographed views of the canyon. Visitors can catch glimpses of the village’s less visited residential areas as they ride on the shuttle — a free bus that moves the park’s vast quantities of tourists throughout the south rim’s hotels and restaurants. El Cristo Rey Chapel is not on the park’s shuttle route. But its Mass schedule — along with directions for walking there — was posted near the registration desk of El Tovar, when this reporter was visiting in March. Father Bercasio, a native of the Philippines, is just completing his first year as pastor. He was appointed last July by the Diocese of Phoenix, which took over responsibility for the church in 1974. He is the first priest to be assigned full time to the chapel. “We are the only Catholic church within a national park of America,” he told a standing-room only crowd of tourists who had gathered for Sunday Mass. Actually, Grand Teton’s Chapel of the Sacred Heart in Wyoming also is located within that national park and is open daily to visitors, although it does not have a resident priest. It is a summer mission of Our Lady of the Mountains Church in Jackson. Priests from nearby parishes celebrate weekend Masses at the Grand Teton chapel during the busy summer season. Sunday Mass also is celebrated during peak seasons at many other national parks. From his base at El Cristo Rey, Father Bercasio also ministers to a mostly Hispanic community founded five years ago about 30 miles outside the entrance to the park. El Cristo Rey Chapel was officially established in 1960, although priests from the Diocese of Gallup, New Mexico, began coming to celebrate Mass for El Tovar’s workers around 1919-1920. Father Bercasio celebrates a daily Mass at 8 a.m., and most of the time, he said, he is the only one in attendance. He celebrates two Masses on Sundays, plus a vigil on Saturdays in summer. Attendance averages seven or eight people in winter. The standing-room crowd in March was highly unusual, he said, but the congregation swells in summer to the point where chairs need to be placed outside. “Every Sunday is new because I get to meet a lot of people from different states and every country. That’s the one thing I don’t experience in a regular parish,” Father Bercasio said at the conclusion of the Mass. This is his fourth assignment in his 13 years in the Phoenix Diocese. Father Bercasio added that he finds inspiration not only in his surroundings, but in the people who visit. Rodriguez-Soto is on the staff of the Florida Catholic, newspaper of the Archdiocese of Miami and the dioceses of Orlando, Palm Beach and Venice.